A review of Peut-Être Theatre's Shh...Bang! Posted: February 16th, 2016 | Author: Ian Abbott | Filed under: Performance | Tags: Anna Woodhouse, Daphna Attias, Maya Politaki, Peut-Être Theatre, Shh...Bang! | Comments Off on Peut-Être Theatre, Shh…Bang! In this world I am a space invader. Shh…Bang! has been designed not for people like me but for those who are 3+ (a set of people with a different and playful response to visual and auditory stimulation) who demonstrate little fear in sharing their thoughts with fellow theatre goers and provide an uncensored reaction to work whether it engages them or not. Here they are absolutely rapt. 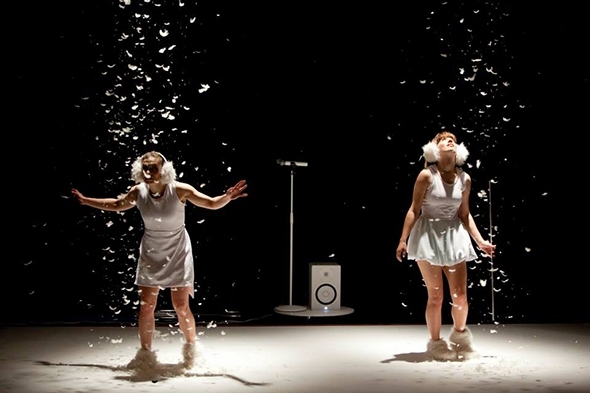 Artistic director Daphna Attias has carefully crafted four colourful quarters where the performers (Maya Politaki and Anna Woolhouse) discover noises, explore what their bodies sound like and encourage gentle interaction with the audience. With several collaborations in the research and creation process (Great Ormond Street Hospital and the Institute of Acoustics and Vibrations in Southampton University), the company has fine-tuned its findings and demonstrates an audience acumen; the visual and aural stimulus from the Shh…Bang! palette is never dull and always surprising. There are swift changes in the choreographic and sonic dynamic, multiple set and prop shifts, a keen awareness of pace and the performers never let a new discovery outstay its welcome. Sound adds a different stickiness to memory and ensures that images linger longer; the moments that reverberate most are when unusual noises mesh with movement in scenographic harmony. When Maya bounces on her haunches like a basketball frog to the harmonica or Anna is casting high-pitched invisible spells from a thin, rosin-oiled metal tube, these were moments of pure invention. Like grains of rice ricocheting on a tight drum skin, delivering 45-minute performances (nine across three days) with an infectious curiosity for sound, energy and movement Anna and Maya were a joy to watch. With a performance that is so entwined with sound and vision, the relationship between technician and dancers has to be sharp as isolated bodily movement triggers farting nose buttons, creaking shoulder locks and other noise eruptions. However, on more than one occasion there is some slight discrepancy between the two, although the more forgiving little eyes in the room didn’t seem to mind. There is a paradox in work made for young people as it has to appeal (through language, imagery and ideology) to adults — the guardians of cultural experience for young people — and they’ll only encounter work that passes their own taste and perceived risk barriers. In the Shh…Bang! audience you already see the different audience personalities in development, even at 3+: those who having been charmed by the performers are happy to go on stage unaccompanied and will bounce, revel and embrace this personal encounter; those who will not leave the lap of the parents, who tuck their head under arms despite an unthreatening invitation to engage, and those who want to bring their adults on stage and enjoy the environment with them in a communal celebration.